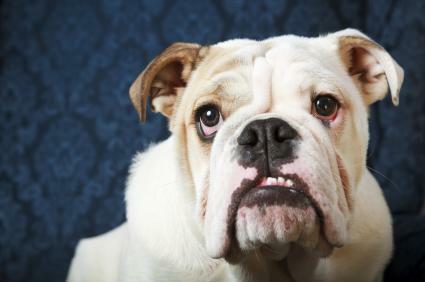 Bulldogs are prone to cherry eye. While not exactly common, cherry eye in dogs does affect some breeds more than others. Learn more about this condition, its possible cause and how it's treated. Cherry eye is the common term for a prolapsed tear gland. Under normal circumstances, the tear glands are concealed beneath the third eyelid of a dog's eyes. The third eyelid is actually the nictitating membrane. This is a thin section of tissue that is normally located beneath the lower eyelid where it cannot be seen. When the gland begins to protrude, it exposes the nictitating membrane. Once exposed, this delicate tissue is easily damaged and/or infected. Although the exact cause of this condition is as yet unknown, the gland may begin to protrude due to a weakness in the connective tissue that is normally supposed to hold it in place. The appearance of cherry eye can be quite alarming to anyone who is not familiar with this condition. The tear gland tends to become dry and irritated once it is exposed. When you look at a dog with this condition, the gland looks like a red, swollen mass in the corner of the eye that slightly resembles a cherry, and this is how the condition got its common name. One or both eyes can develop protruding tear glands. Cherry eye in dogs is not life-threatening, but the condition can impair a dog's eye function The longer the gland is exposed, the greater the chance that it will become injured or infected. So, this condition should be treated as soon as it becomes obvious. A veterinarian can easily diagnose this condition with a simple visual exam of the dog's eye. The veterinarian will then determine the most effective treatment based on just how far the condition has progressed. In some cases where cherry eye has been diagnosed quickly after the condition became obvious, the vet will prescribe an antibiotic, anti-inflammatory medication or a combination of the two in hope of reducing the swelling enough that the gland will go back to its original position on its own. In other cases where the gland is more pronounced and irritated, the vet may decide that the gland must be set back into place surgically to keep it from protruding again. In the past, the protruding tear gland was routinely removed, but this treatment is no longer favored because it leads to permanent dry eye. If the gland cannot be saved and must be removed, the affected dog will need to be treated with prescription eye drops for the rest of its life in order to keep the eye moist. Virtually any dog can develop a case of cherry eye, but there are a few breeds that appear to be genetically predisposed to develop the condition. Bulldogs in particular top the list, but other breeds include Saint Bernards, Boston Terriers, Shar Peis, Bloodhounds and Beagles. Cherry eye is very treatable, and an affected dog has a strong chance of a full recovery if the exposed tear gland is treated right away. There is a greater chance of relapse if the condition is only treated with medication. In many cases, surgical replacement of the gland offers the best odds of preventing a relapse.